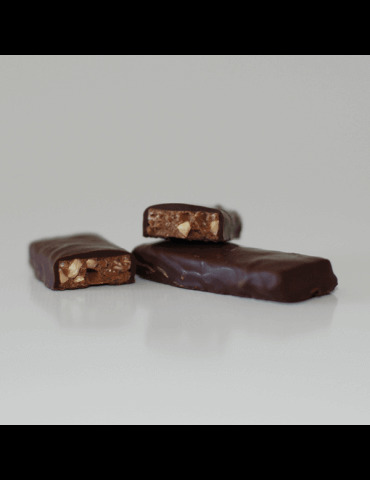 Soft Gianduia Borrillo, gianduia chocolate bar with almond and hazelnut grains, covered with dark chocolate. 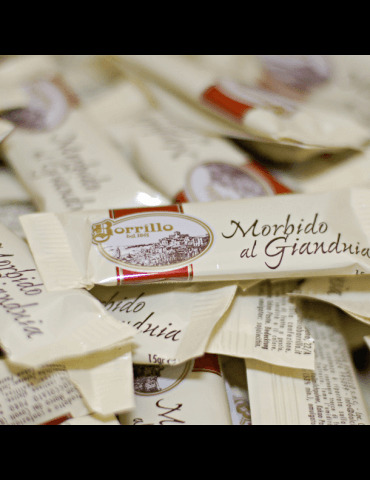 The gianduia nougats are made for over 10 years always following the tradition of the Borrillo family. It is possible to find the product in other versions, click on the images to discover them! Soft kisses in packs of four different flavors, covered with chocolate. 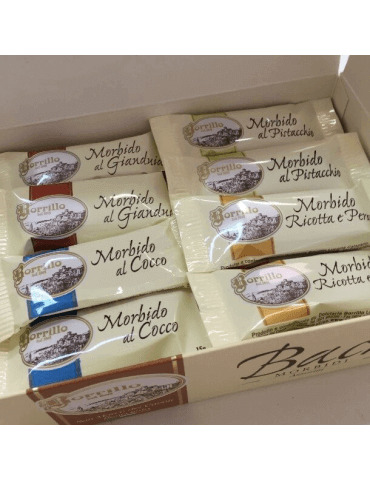 Inside there are the soft flavors of Gianduia, Morbidi al Cocco, Morbidi ricotta and pears, Morbidi al Pistacchio. Package weight 17.63 approx. Soft kisses in packs of eight different flavors, covered with chocolate. Inside there are the flavors of Traditional nougat, Soft Nougat at Gianduja taste, Soft Nougat with Coconut, Nougat at coffee taste, Nougat at Lemon taste, Nougats at orange taste, Nougats at pistachio taste, Soft ricotta and pear. Package weight 31.74 oz approx. The assorted Kisses contains 8 different types of nougatscovered with chocolate. Pack of 6 boxes of 31.74 oz. Total weight approx: 190.44 oz. A sweet delight of gianduja chocolate with almonds and hazelnuts grain, covered with dark chocolate. Package weight 176,37 oz approx. 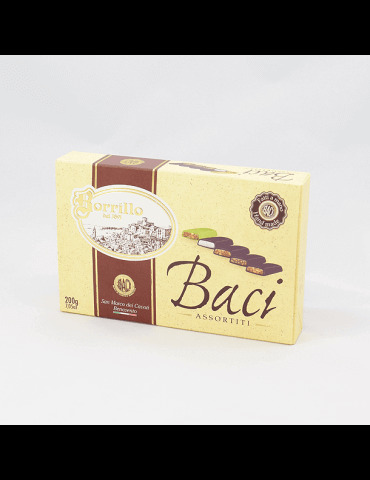 Baci assorted with crunchy with Lemon, Nougat, Coffee and soft crunchy Coconut and Gianduia. Five different nougats, collected in a single box to always carry with you. Package weight 176,37 oz approx. Soft kisses in packs of four different flavors, covered with chocolate. Inside there are the soft flavors of Gianduia, Morbidi al Cocco, Morbidi ricotta and pears, Morbidi al Pistacchio. Package weight 352.60 oz approx.